Eight herb essiac is the most effective essiac both in our experience and in the studies that have been done. Those in-the-know will not accept four herb blends. Eight herb essiac contains herbs that target liver health as well as colon health. Because the health of the body is dependent on both the liver and the colon, the complete essiac formula, rather than the shortened four herb version, does the best job. There is certainly much confusion surrounding the herbal supplement essiac. We understand why you might not know who to believe. Some people claim that four herb essiac is superior, while others believe that eight herb essiac is the better choice. All of this has made it difficult for people to know what they are buying. The ultimate goal for those who sell essiac should be to eradicate the confusion and to help people in their fight against cancer and other diseases. That is why we include a plethora of information on essiac and cancer on this website, why we strive to offer top-notch customer service, and why we offer essiac at the lowest price we can and still stay in business. If you question whether you can trust us, please consider the fact that we offer essiac at a lower cost than everyone else--we're not out to make huge money. Moreover, we rely on repeat business BECAUSE our price is so low. If our essiac didn't work, we would go out of business! Many companies employ scare tactics and misleading marketing claims in an attempt to scare you into spending lots of money on their very expensive essiac. You will NEVER get that here. Please give us a chance to prove to your that our essiac is the real stuff, and the best stuff! 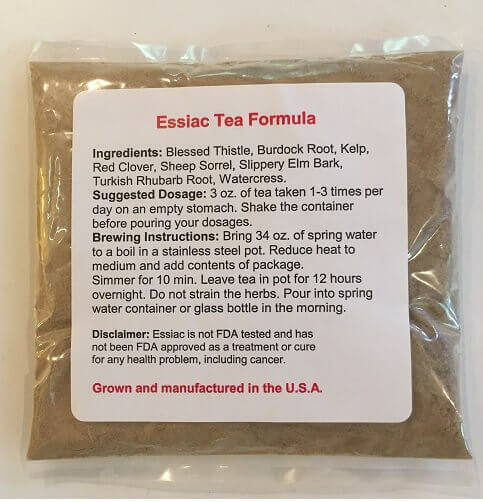 According to many herbalists and in the marketplace today, "Essiac" is comprised of four herbs: Sheep Sorrel (Rumex acetosella), Burdock Root (Arctium lappa), Slippery Elm Bark (Ulmus flilva), and Turkish Rhubarb Root (Rheum palmatum). The four herb essiac formula is in the public domain, and almost every herbalist, altnerative health clinican, and health food store carries it. However, this four herb formula is actually just a smaller version of the eight herb essiac formula. The eight herb formula is the one received and gradually refined by Canadian nurse Rene Caisse (Pronounced 'Rin Case'). Caisse and the doctor began to vary the formula. One version involved injecting one of the herbs (Sheep Sorrel) while administering the others orally in liquid form. 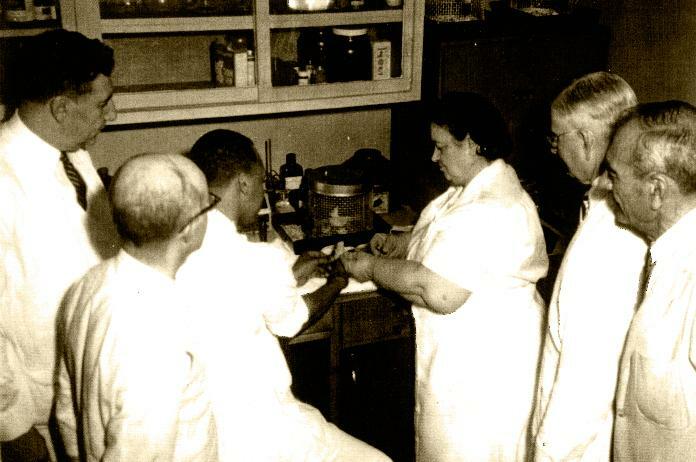 The Ojibway medicine man and his people never injected it; they had simply prepared tea, but Rene had decided to conduct formal research on her formula in hopes that she could improve its efficacy. It was discovered that only one herb could be injected--and only into the muscle. This was a painful procedure for very sick people, and many, due to their emaciated state, had hardly any muscles left that were healthy enough to accept injections. Nonetheless, this partial-injection method of administering essiac was used for several years and there were some success stories that were documented from this procedure. However, there were failures too, and Caisse felt that additional studies were needed. The objective at Dr. Brusch's clinic was to prove the merits of this simple, non-toxic, eight herb formula called essiac. The formula had been used with great success on many terminally ill patients but Dr. Brusch wanted to do even better. They began their research on the essiac using oral treatment only. No other medication was used and the blend of eight herbs brewed as a tea was given on an empty stomach. In the hope of identifying the active ingredient, they experimented with injecting variations of solutions, each vial containing a different herb. This failed to isolate one single herb, proving that effective results are obtained though the unique combination of the eight herbs in the correct proportions--the essiac formula. A contract was drawn up on Oct. 26th, 1977 between Resperin Corporation Limited, David Fingard, and Rene Caisse. The contract provided that Resperin and Caisse would co-operate in the promotion of the Essiac treatment for use throughout the world in alleviation and cure of cancer. Sadly, there was very little compensation in the contract for Rene who had given 56 years of her life to this herbal tea. Dr. Brusch, who was to share any royalty with Caisse, withdrew in this capacity and became only a witness to the signing of the contract. Caisse cautiously passed over a smaller four herb formula that day in 1977, as she already had great doubts about what she had been told. Her doubts proved to be true when nothing seemed to be happening and no clinics were ever opened. To this day, no royalty has ever been paid from this contract to the "Rene Caisse Estate." She gave it away free for 56 years, and has been cheated ever since. Her contract had been breached by Resperin, and technically Caisse reserved the rights to retract her formula, which was a condition stated in the agreement. A further developed formula of this herbal tea, now known as "Flor-Essence," emerged in the marketplace in July 1992. This pre-brewed liquid tea contains eight herbs that its makers claim are in perfect proportion for synergistic activity. Originally this tea was only available in pre-made (liquid) form, which made it very expensive to take on a continual basis. Now, the dry herbs are also available, but Flor-Essence is still more expensive than many alternate brands that contain the same eight herbs. However, Flor-Essence is a highly reputable product and many attribute great results to this tea. On this website you may purchase eight herb essiac at discount pricing to save money. Click here for our eight herb essiac selection. We carry only eight herb essiac as this formula is the most effective formula according to the clinical trials by Rene Caisse and Dr. Charles Brusch. Disclaimer: Eight herb essiac is not FDA tested and has not been FDA approved as a treatment or cure for any health problem, including cancer. We do not represent it as such on this site. You must determine whether eight herb essiac is a treatment method you should pursue. We have provided accounts and descriptions that represent the opinions of a variety of experts in the alternative treatment world as well as actual users of eight herb essiac. We believe that our formula is the most effective essiac formula being sold in the world, and that our essiac tea ingredients are of the highest quality. However, we do not endorse anything on this site as medical fact.